Here are some well-kept secrets about Breeders that you may not know but we will enlighten you now! Older puppies can often mean nearer to show quality. Breeders often 'run on' puppies to see how they will turn out for the show ring -- something that most pet owners are not concerned about. Who cares how the ears are stuck on their heads?! As long as they have ears, the positioning of those body parts are of no consequence to pet owners. 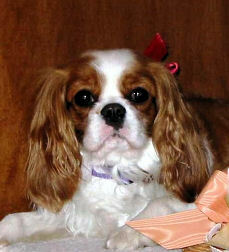 What is of most important to pet owners is the dog's health and temperament. The point is that you could well purchase a spectacular Cavalier as an older pup (4-10 months) with the added advantage of the pup having better bladder control thus less frequent trips outside for elimination purposes, so do not discount them. Some adults can be available at an extremely reduced cost or for free. There are multiple reasons, one being the adult dog's age (6-8 years of age) and another being the adult dog's minor health concerns (loose patella, not perfect hip x-ray results, slight murmur, etc.) and these dogs could well be much younger, like 2-5 years of age. Sometimes breeders retire perfectly healthy adults from breeding at 4 to 5 years of age and place them as pets in pet homes. These dogs, while slightly discounted, may not be free. It would depend upon the breeder. Either way, if you have a big heart for older dogs, but not such a big purse to purchase a puppy, this might be the way to go. Make sure you ask the breeder if they have such a dog. ALL breeders have produced problem puppies from time to time -- it happens. 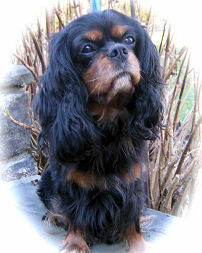 It doesn't mean they are bad breeders when they produce pups that are "Special Needs" Cavaliers. Some families love to adopt such a dog and take special care of their new family member -- other families could not handle any kind of problem. We are all different but again, this might be another option to think about asking breeders. Some of the "Special Needs" pups and older pups range from heart murmurs, patellar luxation, open fonts (a wide open soft spot on the top of the skull), hydrocephalus, quirky temperaments, extremely shy, birth defects and so on. Caring for one of these special little souls is incredibly rewarding. Even a slight breakthrough with a "Special Needs" dog elicits breaking out the champagne to rejoice in an owner's success! MAKE SURE YOU ASK THE BREEDERS ABOUT SUCH DOGS IF THIS INTERESTS YOU!